Does Pickles think that Wirral Council’s £22,500 newspaper plan “pours taxpayers’ money down the drain”? Prior to the Birkenhead Constituency Committee meeting held on the 10th April that decided to go ahead with the “community newspaper” idea, Graham Burgess (Wirral Council’s Chief Executive) would have received this letter from the Department of Communities and Local Government about council’s compliance with the Code of Recommended Practice on Local Authority Publicity. So what does the code state on frequency? Moving to the bit in the letter that states “it is a matter of concern to the Government that there are still cases where this is not so, for example, local authorities issuing publicity that is political in nature” the report to the Birkenhead Constituency Committee states “The content of the publication would be devised from the committee and community requests.” Everyone on the Birkenhead Constituency Committee is a politician (whether councillor or MP), does the public expect their requests for what goes in it not to be political. As there won’t be any advertising in the first three editions personally I don’t think there will be enough “community requests” for three eight page editions so the majority of the content is likely to be suggested by politicians. Here was what was said at the Birkenhead Constituency Committee meeting on this item which starts at 21:28 in the video above. The second item on this Councillor Doughty talked to last time was around a local publication, so we’ve done some further thinking around this and just to clarify what this will be, it will be a community focussed publication supporting people with what’s on in the community. The data shows that the feedback that a lot of Members get is not all our residents get the local newspaper currently. It will be a focus on work with other public sector organisations and we’ve got a group together called of the Birkenhead public services. What I’ve asked from them is what they currently do around their communication, what spend, what tools they use and I’m collating that together to look at across us all what we use and what we’re spending, what are we doing and is there any way we can pull that together. What we’re asking from the Committee is a pilot of three editions to see if it works and to monitor that pilot there will be two subgroups and one will look at it will be an editorial board that will ensure the content is non political and it’s what people want to read on the feedback we’re getting. It’ll aim to recruit an apprentice for nine to twelve months and involve the community around the community news and how that’s developed. So we’re talking as people have been appearing through this there’s been a really positive feedback from some, from a lot of people saying we’ve had for example a few of have been today at a conference around food planning and how people are struggling accessing food and what, there’s massive support out there with people saying I don’t know where it is around initiatives such as somebody wrote to Councillor Kenny saying that we’ve got an initiative around supporting to access free bikes and that’s the sort of information to go in there. Any questions? Questions on that? Yes please, yep? Did you find out about whether the Council actually paid additional money to have the newspapers circulated everywhere? Did that actually happen? My understanding was that it used to happen, it doesn’t happen now. So it’s too late to have any redress for it? Phillip I think we should actually follow that up, it’s a serious point. Can we actually have that in the minutes please and follow it up? What happened to that? As I understand it, that’s what we used to do. What we have got since the last meeting is a breakdown of where it is going and where it isn’t going so we can help with that. So what we’re going to be doing, again it comes back to this whole point what does the contract say and is it actually being fulfilled, if not what do we do about it? (At this point he looks at officers to his left and says sotto voce “answer this evening”)? Really, thanks. There’s something called the Wirral Public Service Board. Last year I made a Freedom of Information request to Wirral Council for the agendas and minutes of their meetings over the previous year. That request was refused by Surjit Tour under s.36 (2) (b) (ii) of the Act stating that releasing the agendas and minutes would (or would be likely to) inhibit “the free and frank exchange of views for the purpose of deliberation.” and have a “chilling effect” on their discussions. He also refused it on the basis that the minutes would contain the names of people (data protection grounds). So just to recap, Wirral Council won’t release the agendas and minutes of meetings held with other public sector organisations at which the decisions and discussion about joint working are made. However they plan to write articles about the decisions made at these meetings and the joint work that Wirral Council is doing in a publication they plan to send out to 39,823 properties in Birkenhead? Oh and after the third edition Wirral Council will charge these other public sector organisations to include details about these projects in their “community newspaper”? I don’t believe there is as much support for this community newspaper idea as was claimed at the Birkenhead Constituency Committee meeting. I previously wrote about this proposal and included a poll. The poll’s question was “Do you think Wirral Council should spend £22,500 to start a community newspaper in Birkenhead?” with the three following answers to choose from yes, no and don’t know. At the time of writing nineteen people had answered the question. The results were clear, eighteen said no and one answered don’t know. So did Wirral Council’s Chief Legal Eagle Surjit Tour point out Eric Pickle’s new legal power (which has been in force since the 30th March 2014) to direct Wirral Council to comply with the code (which as outlined above the proposal as it stands doesn’t)? No Mr. Tour didn’t (but then he wasn’t asked for any legal advice on this item). The taxpayer pays him a salary of £73,352 a year. His role (according to Wirral Council’s constitution at 2.3 of Wirral Council’s financial regulations) is defined as follows “The Monitoring Officer is responsible for reporting any actual or potential breaches of the law or maladministration to the Council and/or to the Executive”. No councillor or MP asked Surjit Tour during the meeting whether aspects of the proposal for a community newspaper were lawful and for his advice. Surjit Tour didn’t say anything during this item and the letter from the Department of Communities and Local Government went to Graham Burgess (so it seems likely that Surjit Tour hasn’t seen it). The letter from DCLG finishes with “If you have any questions about the new powers, please contact ConductCode@communities.gsi.gov.uk. You can also contact the Rt Hon Eric Pickles MP directly at eric.pickles@communities.gsi.gov.uk. The Rt Hon Eric Pickles MP said about the very issue of Council newspapers “The spread of the town hall ‘Pravda’ is manifestly unfair because they offer cut price local news, but mixed in with council propaganda that pours taxpayers money down the drain. So is Wirral Council going to change its plans or run the risk of a showdown with the Rt Hon Eric Pickles MP over their newspaper plans? The Liverpool Echo also ran a story about this on the 26th March using the headline FURY OVER TOWN HALL PAPER PLAN; Town could see launch of newsletter. I’d be interested to read your thoughts on this issue which you can leave as a comment (even anonymously if you wish) or contact the Department for Communities and Local Government or the Rt Hon Eric Pickles MP directly yourself to let them know your views on what Wirral Council is proposing to do. All in the spirit of Goebbels and Big Brother’ Newspeak. which is quite an achievement to provoke such a strong response considering the first edition hasn’t been written yet! who never have a case to answer & secret reports which never see the light of day so what the use of newspaper is yet another gross waste of time & money. Well from reading up on similar council newspapers in different parts of the country, even if they don’t start as propaganda, they end up that way giving a taxpayer funded advantage to whoever the ruling administration is (and it’s never a good thing in a democracy for one political party to get an advantage courtesy of the taxpayer). As to the large payouts to officers, a change in legislation means that payoffs of £100,000 or more has to be agreed by a meeting of all Wirral Council councillors. A change to Wirral’s constitution means that most compromise agreements below that amount but about a threshold of I think £30,000 has to be decided by a panel of three councillors. Despite these being decisions about large sums of money, councillors have agreed each time to exclude the press and public (on officer’s advice) from such meetings which hardly helps with openness and transparency. As to “secret reports”, I do my best to try to push for openness and transparency, but you only have to look at how many of my Freedom of Information Act requests to Wirral Council are refused (for various reasons) to see that openness and transparency don’t seem to be embedded as part of their culture. 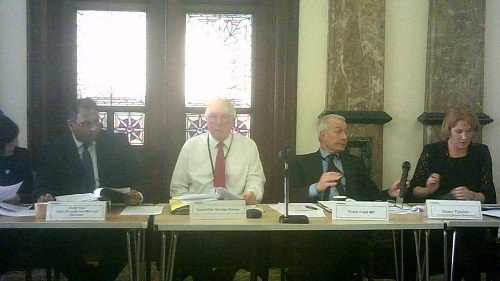 Wirral Council’s two-bit schemers never learned their lessons and are still abusive and drunk on political power. I’m going to spend some time tonight writing a detailed and persuasive letter to Pickles. If “WirralGate” itself doesn’t arrive to call time on their dodgy pipedreams, then this letter and others will. I have plenty of evidence to back this up, which I’m sure will help to tip the balance back in favour of the abused taxpayer. Being a Tory, Pickles hates challenges to the throne, worse still, Torylite pretenders like Frank Field and chumz, disobeying his edicts. If he isn’t minded to pour cold water on this waste of £22k before he reads the letter, he damn well will be after. Great work John and thanks for providing this valuable extra evidence of foul play. Well good luck with that. I thought you might be interested (although you may know already) by what’s happening in Tower Hamlets. Eric Pickles has sent in some auditors from PwC after allegations were made of “governance failure, poor financial management and fraud”. Certainly despite what was said at the November Improvement Board by the district auditor that the government powers to intervene in local councils had been repealed where there are serious allegations of things going wrong, Tower Hamlets would seem to prove that national government does have legal powers to do so.